On a regular basis I create CAD floor plan drawings of existing buildings. Today I’ll dive into my project archives and summarize one such project. 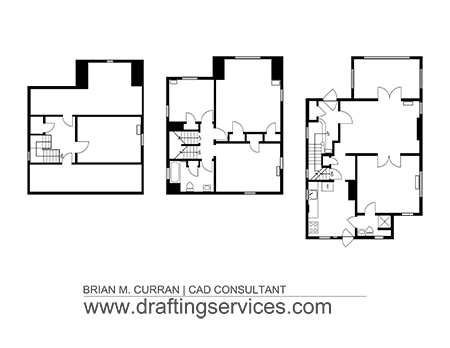 In the beginning of 2010 a regular client of mine contacted me because he was in need of some measured drawings. He had recently purchased a 3 story house as an investment property, and he asked me to draft measured floor plan drawings of the house. He wanted the drawings delivered to him in CAD and PDF format. When I arrived on site I found out that the house had a very dense layout. A dense layout would be defined as a layout with a high percentage of closets, rooms and stairwells per square foot. Some houses that I create drawings of have wide open layouts, and some have dense layouts. A dense layout equates to more measuring and drafting time. Type and Location: A residential house, located in Queens, NY. Scope of Work: Create detailed measured plans of all three floors of the house, including adding dimensions to the plans. Floor Plan Area: First Floor = 808 sq.ft., Second Floor = 631 sq.ft., and Third Floor = 597 sq.ft. Was the space occupied with tenants? : No. Access Restrictions: No. The house was vacant, so the client had one of his employees meet me onsite and unlocked it for me. When I was done with my field measuring work I pulled the locked front door closed behind me, and called the client to let him know I was finished. CAD Drafting Time: Total of first floor, second floor and third floor = 7.75 hours. Misc. Time: 1.00 hours of project coordination. Field Equipment Used: Hand held laser, tape measure, camera (optional), pens, pencils, eraser, paper and foam board. Comments: The CAD drafting time includes time spent adding many dimensions to the drawings. These dimensions are not included in the image below. A project sample of CAD floor plans. That’s all there is to this project summary! Please check back in the future for new project overviews!